The Bowles-Simpson Cuts: What’s the Alternative? 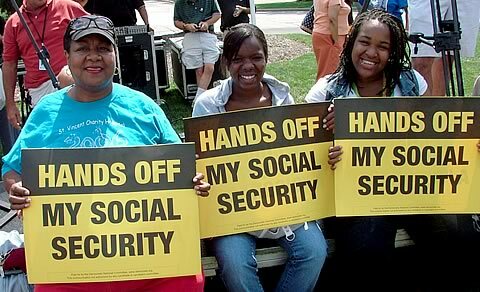 THE SOCIAL SECURITY “reform” proposal by Erskine Bowles and Alan Simpson, in advance of the December release of the “bipartisan” deficit reduction commission appointed by president Obama, is only the preview of a coming series of savage attacks on programs that working people in the United States have counted on for decades. These assaults in the name of “budget discipline” will dominate the legislative agenda for the next Congress, and for dozens of state legislatures as they face the threat of bankruptcy. For detailed analyses of the attack on social security in particular, you can subscribe to the excellent online “Social Insurance Group”. What’s the alternative? For one thing, the phony “crisis” of Social Security can be largely resolved simply by removing the $107,000 ceiling on income subject to the social security payroll tax. But this is only one part of a much bigger set of struggles over whether our society will become ever more unequal and more unfair than it already is. The following piece by Dan La Botz is an excerpt from Chapter 8, “Creating a Strong System of Social Wellbeing,” of La Botz’s online book, A Vision from the Heartland: Socialism for the 21st Century, written in the course of his recent campaign for U.S. Senate on the Ohio Socialist Party ticket. It summarizes what a policy based on human needs would look like. The bosses today are going after both our personal and our social wages. They are demanding wage cuts, and asking for increases in our contributions to the health and pension plans, while at the same time they are demanding tax cuts. The result is that our earnings and our standard of living are being whittled down on both ends, both the individual and the social. We need to organize to resist this attack on us, our children, and our aging parents. We need to resist for ourselves and for future generations. Our present Social Security system was established in the 1930s as a response to the Great Depression and to the working class upheaval of that era with its mass strikes, factory occupations and street battles between workers and police. Fearful that workers would turn to more radical action or even to revolution, the U.S. government created the modern social welfare system with Social Security at its heart. The Social Security system provided workers with very modest retirement benefits based on their lifetime earnings. Some groups of white collar workers have since the early twentieth century had company retirement plans which after the 1930s were supplemented by Social Security. During the 1940s, because the Social Security system paid so little, labor unions began to negotiate additional retirement benefits for union members. For about a third of the American working class, their total retirement benefits would be made up of the combined Social Security payments and union pension plans, while about two-thirds had only Social Security. We have had then for decades a retirement system which was highly unequal, with some enjoying private retirement plans while and many others received a Social Security payment that was quite modest and often not enough to keep them out of poverty. Social Security is absolutely essential for most elderly Americans. For two-thirds of elderly Americans, Social Security represents a majority of their income, while for 20 percent it represents their entire income. The Social Security benefits are not very generous. Today most beneficiaries receive 33 percent of their previous earning, and by 2030 this will be reduced to 29 percent. Though they receive Social Security benefits, retired workers who had low lifetime earnings and disabled workers and their families still often live in poverty. Cutting benefits to deal with the shortfalls in Social Security financing would thrust millions more into poverty. Cutting social security benefits is unconscionable and unacceptable. According a recent report by the Trustees of Social Security, even if the U.S. economy grew at the extremely low rate of only 1.6% a year, the revenues of Social Security based on the current level of payroll taxes would cover currently planned benefits for another 38 years and would be enough to finance about 70% of all benefits through 2078. How could President Obama have appointed such a man to head up Social Security reform? Obama has warned that Republicans want to privatize Social Security, when the real threat is that the Democrats joined by the Republicans will cut its budget. The reasons have to do with the shared desire of the Republican and Democratic parties to reduce employer contributions and workers’ benefits. To justify reforms that will restructure the system and reduce the scope of Social Security, the argument must be made that the system is in crisis, though, in truth, no immediate crisis exists. While a financing shortfall is foreseeable in the distant future, it can be easily remedied by taxing the wealthy. What kind of reforms can be expected from the Republicans and Democrats? President George W. Bush proposed the privatization of the Social Security system, but that proved so unpopular that the Republican Party is not likely to try such a direct attack again–though for some that will remain the long term goal. The Democrats can be expected to propose changes that reduce both the beneficiaries and their benefits. Raising the retirement age at which one is eligible for Social Security benefits. Reducing Social Security benefits for future beneficiaries. Turning Social Security into a targeted needs-based system, rather than a universal system. Along with the creation of such a targeted, needs-based system, the encouragement of parallel or alternative private retirement insurance. The goal of all of these reforms is to foist economic responsibility for the system onto working people, and to relieve the wealthy of responsibility. All of these reforms would represent a reduction in government benefits or what we have called the social wage flowing to workers and at the same time they would represent an increase in the share of the national wealth enjoyed by employers. None of these reforms are acceptable, and in fact, we should move in the opposite direction, raising taxes on the wealthy and raising benefits for all retirees. While Social Security is not in imminent danger of collapse, we do need a plan to address projected shortfalls in the more distant future. What might be done? First, the burden for Social Security should be shifted on to the employers. The employers should pay not 50 percent, as they now do, but 100 percent of the costs of Social Security. Second, corporate contributions should be increased to a percentage which guarantees that there will be no shortfall within the next 100 years. Third, there should be no further raise of the retirement age above what is now considered the full, normal retirement age of 65. Most people begin working at around 20 years of age. Forty-five years of work is enough, whether for those working in hard labor jobs of those at mind-numbering sitting in front computers. People must be able to retire while they can still enjoy the fruits of their labor through fulfilling recreation, education, and travel. Fourth, benefits should be increased proportionally, with the greatest increases going to those who had lowest lifetime earning and therefore have lowest benefits, in order to both raise and equalize payments for all workers. We should create a Social Security pension system for the elderly that is sufficient in itself to provide for retirement in dignity and comfort without other private or union retirement plans. The long term goal must be the development of a national economic plan, based on the socialization of the private corporations, which provides for a happy and fulfilling later life for all of our citizens. While Social Security does not face an immediate crisis, our health care system does, because it is unsustainable. The Obama Health Care Reform certainly has its positive side. It does extend health care coverage to 32 of the 48 million uninsured in the United States and provides greater protections to insurance consumers, for example by eliminating the issue of preexisting conditions, although it left many other issues unresolved. However, the key issue of rising health care costs which threatens to destroy our entire health care system was not addressed. Costs will continue to rise, and consumers will be forced by circumstances to purchase insurance with inferior coverage. Meanwhile employers are using the Obama reform to reduce their health care costs and to foist those costs on to the public and their employees. Under the Obama Health Care Reform, both employers and insurance companies have motivations to shift costs onto workers. Beginning in 2014, employers will be tempted to push workers out of their health plans and into the state insurance pools. Insurance companies will continue to raise premiums, deductibles and copayments. Many workers faced with choices of insurance plans offered in the pools will choose the cheapest plan so they can pay their mortgages or pay to send their kids to college. They will end up with inferior and inadequate health insurance. And the whole system will be faced with collapse by the rising costs. The programs created in the 1960s, Medicare for the elderly and Medicaid for those with low incomes, are essential programs which must be saved. But we cannot save them if we do not keep health care costs under control, and we cannot do that while for-profit companies stand at the center of our system. We must create a “single-payer” health care system—something like Medicare for all—which eliminates the insurance companies from the system. But we also need to socialize the for-profit health and hospital companies and the pro-profit pharmaceutical industry. Ultimately, we need a U.S. Health Care System which eliminates eliminate all private for-profit elements from the system: insurance companies, hospitals, and the pharmaceutical companies. Our health is too important to be in the hands of corporations and their greedy CEOs. Health professionals, labor unions and workers, and the patient consumers can democratically elaborate a system which would serve all at no cost. We can tax the rich to pay for this system. Today all of the programs that help to maintain and enhance the wellbeing of the American people are under attack. Republicans and Democrats both aim to dismantle the social safety net, beginning with Social Security. If American working people don’t wake up and fight back, we will find ourselves standing by watching the destruction of Social Security, Medicare, Medicaid, and the rest of our system.